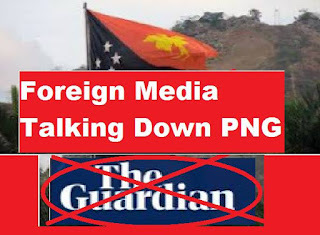 The continued scandalous and defamatory articles in foreign news such as the Guardian is more of your typical grasping at straws reporting that only tries to talk down the country and its leaders by a journalist desperate to make a name for them self. The Chief of Staff to the Prime Minister, Eddie Mike Jondi said the article makes claims that they say ‘may’ be true and quotes from sources who they say did not want to be named. “This is shoddy journalism, that also tries to lampoon the hosting of APEC in Papua New Guinea and denigrate partner APEC economies,” Mr. Jondi said. “It is disappointing that when a developing country such as Papua New Guinea accepts the challenge to host one of the most important forums in the world, that people resort to fake news and sensationalism. “These people, along with their friends in the Opposition who have pushing this Golding/Wild Cat JV, are the same people who say we cannot host APEC. It is our job to prove them wrong. “In terms of the misleading story about Golding/Wild Cat JV, this is the same story that the opposition-backed media tried to push before the election and their claims were discredited. “You cannot deny the facts, and the facts are what this journalist failed to provide. “The ADB contract concerned was awarded to a publicly listed Australia company Golding Contractors Limited and Wild Cat was a small local partner. “All procurement processes were strictly followed by the Asian Development Bank and the National Government as in the case of all publicly tendered projects. “Very importantly, and the Guardian conveniently miss this point, the Government of Papua New Guinea has no say in the selection of contractors for ADB contracts. This is done independently by the ADB, and this is then presented to the National Executive Council for endorsement. “So to imply there is somehow a conflict of interest, when the Government has no say I this process is very inaccurate and irresponsible of the Guardian and the journalist concerned. Mr. Jondi said the company was based in the Southern Highlands and Mr. O’Neill did have an interest in the business which was declared in full to all relevant authorities and he has divested his interest in the company. “The company has since suffered major losses after it was attacked and buildings were burnt down after opposition attempts to link Golding/Wild Cat to Mr O’Neill. “That was reckless behavior by the opposition that cost a lot of jobs and losses to property when they knew Mr. O’Neill no longer had any interest with the company. “It is very sad to see that because of mindless political games, Papua New Guineans, especially Leaders, are discouraged from investing in our own country. “The moment an investment is made, journalists like the one from the Guardian will again try desperately to link this with false claims. Mr. O’Neill is seeking legal advice on this matter with the intention to take legal action against the Guardian and the journalist involved.